Face the music: the arts and entertainment industry has all but run out of original concepts. From Hollywood to the triple-A gaming industry, mainstream entertainment is a soulless machine that churns out tasteless remakes of timeless classics, each with their own laughable gimmick and clone-like replicas of recent breakout successes or whatever happens to be trendy. Understanding that this is the current state of the entertainment industry, Capcom’s “Resident Evil 2” remake is not simply a breath of fresh air, it is a love-letter to those who remember the gaming industry of old. Sure, in those days the product was nowhere near today’s titles in terms of scope, gameplay mechanics and graphical capability, but every big-budget title looked like the writers and designers were at least mildly passionate about it. “Resident Evil 2” leaves no questions as to whether its production team was passionate about it. It appears they were in love with it; and after playing it, most customers would likely say the same. It is not simply a mildly more attractive version of a classic from a bygone age: it is a beautiful retelling of the story outfitted with all the magnificent possibilities of a next-generation title. A perfect place to begin is with the story. 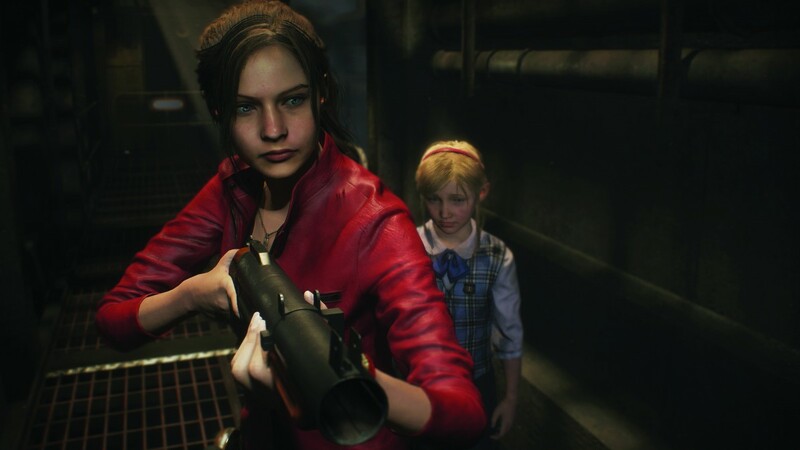 Without giving anything away, the story mode has been given an excellent new introductory sequence and is still provided in two separate but intertwined segments of Claire Redfield and Leon Kennedy’s experiences. Though it has been tweaked to provide some new twists and turns, the story is still the same cliché, late-90s zombie survival story. It is both corny and predictable, but the nostalgia of returning to Racoon City to uncover the Umbrella Corporation’s dangerous biochemical experiments and put a stop to them gives the story an endearing quality. To the benefit of the less-than-compelling story, dialogue and sound design have received extensive overhauls. From character dialogue and voice acting to the background noise and groans of mindless reanimated corpses, the sound provides an overwhelmingly immersive experience, particularly when playing with over-ear headphones on. The lighting, textures and graphics are also phenomenal. Capcom has done far more than the bare minimum in terms of graphical upgrades. Everything from the ceaseless rain outside the Racoon City Police Department to the flickering lights and damp floors lends itself to an unnerving atmosphere. Leon and Claire’s flashlights are particularly realistic, creating an uncertain and hazy peripheral view in lengthy, dark corridors. All this would not be possible were it not for the most welcome change in the “Resident Evil 2” remake. This time, the game is not a series of fixed-camera set pieces connected by doors and loading screens but a fully-realized, three-dimensional rendering of the world. And the player goes along with Claire and Leon in a far more personal, over-the-shoulder third-person camera angle. Still, the game has one major flaw that makes it horribly frustrating. It utilizes the old-fashioned fixed save-point system in which there are specific rooms throughout the map where the player can save there at their leisure or compulsion. But if one slips up somewhere along the way, they may end up replaying lengthy, irritating portions of the game ad nauseum. This is exacerbated by a relatively small inventory and the endless backtracking the player will be forced to do to find inconsequential items they had missed earlier in order to solve numerous, simplistic puzzles. If that was not enough, Capcom has also incorporated a fun yet anger-inducing mechanic in which the average zombie enemies take a random number of bullets to down or kill. In a game where ammunition can be scarce, one can see where this may become problematic. But if slogging about the map with sweaty palms whilst being chased by unkillable bosses from time to time sounds fun and intense, the difficulties that plague this game just may bring joy to one’s play-through. For all its flaws, “Resident Evil 2” should come to serve as an example for video game developers in the future. Remakes should lend themselves to old and new players alike, and they should be far more than simple retreads with new textures and a couple extra polygons added to object and character models. That said, “Resident Evil 2” is still just a remake. It never reinvents the wheel; it only reinvents itself. And despite the fear and fun that come with playing it, “Resident Evil 2” is anything but perfect or groundbreaking.